Book Bite Reviews: I'm Participating in Bout of Books 12! Are you? 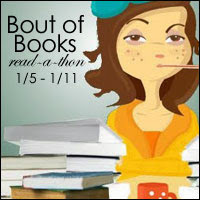 I'm Participating in Bout of Books 12! Are you? Yay! It is time for another bout of books read-a-thon! I absolutely love participating in these. It is my favorite read-a-thon and I always get some good and much needed reading done. Are you planning on participating? Let me know in the comments!